The parking complex, which will include two subterranean levels, will have 500 parking spots. The First Place Tower parking garage, featuring a predominantly blue exterior, is expected to be completed this fall, developer Stuart Price said. Officials with Price Family Properties, which owns the $12.8 million, under-construction facility at 419 S. Main St., revealed the color scheme and talked about the project at a news conference Thursday morning. The parking complex, which will include two subterranean levels, will have 500 parking spots, a tunnel connecting to the Main Park Plaza parking garage and a skybridge linking the facility to the second floor of First Place Tower. It also will include 3,000 square feet of retail space on the ground floor, enough room for as many as four restaurants, said Price, chairman of Price Family Properties. The outside of the facility will appear primarily blue, with anodized silver and gold accents, during the day. But the facade also will feature vertical aluminum fins and lighting that will enable it to switch colors during holidays and other special events. “They have a pattern of spacing that allows them to let air through and also to become like a security barrier for the bottom floor,” said Larry Vorba, principal and director of structural engineering for Cyntergy, the complex’s architect. The variety of hues will improve the experience for pedestrians, said Price, adding that the facility is scheduled to be “topped off” by Halloween and completed within 100 days. “You might have a red, white and blue color scheme on the Fourth of July,” he said. “Even though it’s tinted blue, if you’re a Prince fan, you might go purple one day a year. I like the patriotic potential and the other things. The BOK Center’s opening in 2008 has paved the way for more than a $1 billion in downtown development. Price Family Properties owns and manages more than 2.2 million square feet of office space downtown, a 13-plus building portfolio it purchased about a year and a half ago from San Francisco inventor and philanthropist Maurice Kanbar. Tulsa Mayor G.T. Bynum said the investment and commitment of Price Family Properties to downtown are to be lauded. “A lot of the time, you don’t hear a lot of mayors excited about building parking garages,” he said. “But what I love about the partnership between the city and Price Family Properties is that they are not building just a parking garage. 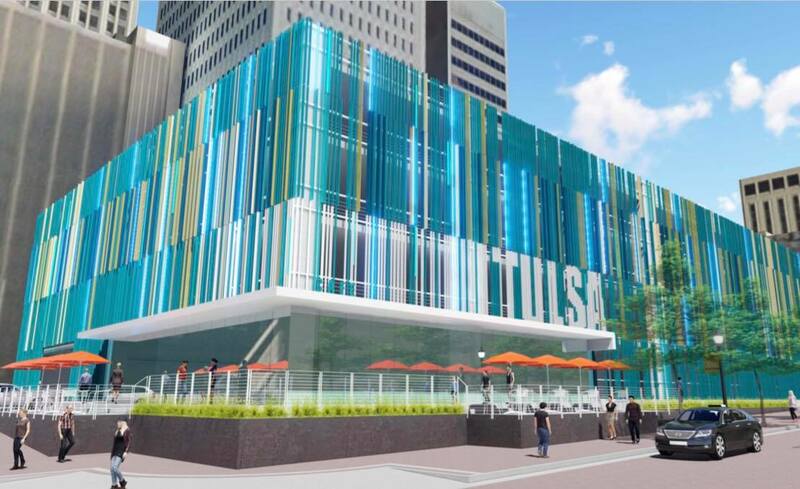 We are really rethinking the way that parking facilities in downtown Tulsa work, how they operate. The First Place parking garage will be exclusively for First Place tenants, said Price Family Properties spokeswoman Ally Lightle. “We’re all in this together — the hotels, the apartments, the retailers, who wake up every day and make Tulsa a vibrant place,” Price said. “There’s over a billion (dollars) that has been spent downtown, and there will be billions yet to come. This is a happening place. The project is benefiting from a municipal loan of $1.67 million. The Downtown Development and Redevelopment Fund loan would provide First Place, LLC, a business arm of Price’s, a six-year exemption on local property taxes and allow it to repay the loan over a 12-year period, documents show. The original article published by the Tulsa World can be found here.